and all the Captain Underpants books. His favorite author is Dav Pilkey who is also the author of Dogzilla, When Cats Dream and other great ones. And whether you are a kid or not, Pilkeymon's Paintbox is fun. NFI PA Ex Libris: Confessions of a Common Reader by Anne Fadiman, a memoir of her word-obsessed family. They read, discussed, and argued about anything in print. This is a non-fiction trade paperback, so you would find it on the shelves nearest the newspapers. "Mass market" paperbacks are the short, fat ones in the revolving racks. "Trade" paperbacks are the taller, skinny one. 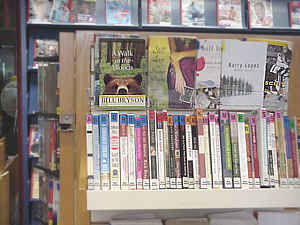 You will find most of the fiction ones on the display wall. We also have special places for certain types of content: classics, science fiction, romance and so on. So you need to look carefully at the item information line at the bottom of each catalog record.